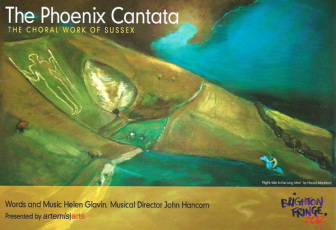 Helen was originally inspired to create the Cantata by the people and legacy of the Phoenix Ironworks in Lewes, East Sussex. The work embraces the stories of the iron workers, our connection to the land, the elemental forces of fire and water, themes of war and the power of nature. It is a people’s Cantata involving community choirs, a children’s chorus, professional soloists and the specially created Everyman Ensemble group of male singers. The Cantata has already had a wonderful response from the community and people of all ages are taking part in choral workshops and excerpt performances led by the distinguished musical director John Hancorn. Nearly 100 people sang in 2 showcase performances of Cantata music at Brighton Fringe Festival!